your heart controls your hand. It is such a treat to see your heart, brain and hand together for such inspiring portraits. pets or people. Thank you for the treat to our heats and brains. "Michel...Thank you ever so much for the warm and so life-like drawing. You captured him so well! I was taken aback... Wow...Wow!!! You have a very unique talent. I will treasure it forever. Thank you ever so much..."
"Michel Angelo, I want to personally thank you for the wonderful drawing you did of my wife. The attention to detail and realism floored me! I will certainly recommend you to my family and friends and I will definitely be back!!!" "I love the pictures you have done of my daughter and puppy! Can't wait to see the other daughter and dog! You have such a gift." "Your heart, eye and talent show in every drawing. Never stop." "You are the most talented artist I have seen. Your portraits stand out as sensitive and creative renderings of the subjects you work with. Keep drawing forever, we will all be pleased. ​Michel is a very talented artist. His work is beautiful and he is able to capture the essence and likeness of a subject in a photo exactly. The picture is more than what I ever expected. I am extremely pleased with the outcome. ​Michel, the drawing was well received. Thank you again very much for your hard and speedy work! Truly a memorable piece for everyone! Here you'll find some great tips and useful information on developing your artistic talents and skills and how you can find artistic services when purchasing custom art drawings as a gift for family and friends. "When you are beginning drawing a portrait the first step is to establish the overall outside shape of the head. This entails accurately gauging both the height/width proportion and the actual shape. The more common term for this is the contour, but I prefer to call it the arabesque as it denotes a rhythmic quality. The most common error is to begin with an eye and 'growing' out the face from there. Once in a while you will get a decent drawing but such a method lacks consistency. The likeness of your portrait is determined by that initial big shape, the arabesque. Everything else is subservient to it. From there it is a matter of breaking down the big shape into the smaller corresponding shapes such as the features, hair, neck, etc. If you can get that big shape down accurately you can easily get the small shapes. This is working from the general to the specific." 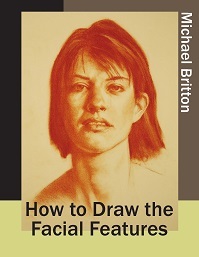 How to Draw the Facial Features Ebook! This free ebook is your indispensable handbook on how to draw all the features of the face! Six chapters detailing step-by-step how to draw the eyes, nose, mouth (and the smile), the ears and the collar bones! Learn how to draw portraits and faces like a Master.